Sunrise Micro was contracted to design a cashless credit transfer system for Global Gaming Industries. This system complies with the poker machine guidelines set down by the New South Wales State Government. Shown is the interface board developed as part of the project. This board interfaces the standard port of a NSW approved gaming machine to the Global Gaming central credit controller. 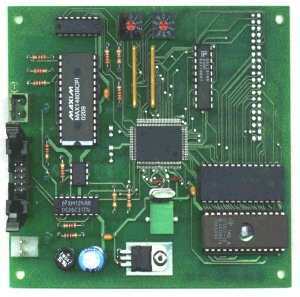 The interface pcb's game port communicates with the gaming machine, using the protocol set down in the regulations. The interface pcb's controller port communicates by an isolated RS485 network to the central controller. The interface board software makes the necessary protocol conversion. The main PCB for the central credit controller is based on one of the game board platforms we had previously designed for Global Gaming. We re-developed the software to implement a user interface by means of a POS style keyboard, a monitor and a printer.